The Scoop: If you’re looking for an original date idea, the National Museum of Math (aka MoMath) has got your number. This New York City attraction is full of imaginative and mind-bending exhibits that use math to create wondrous illusions, puzzles, and artistic displays. 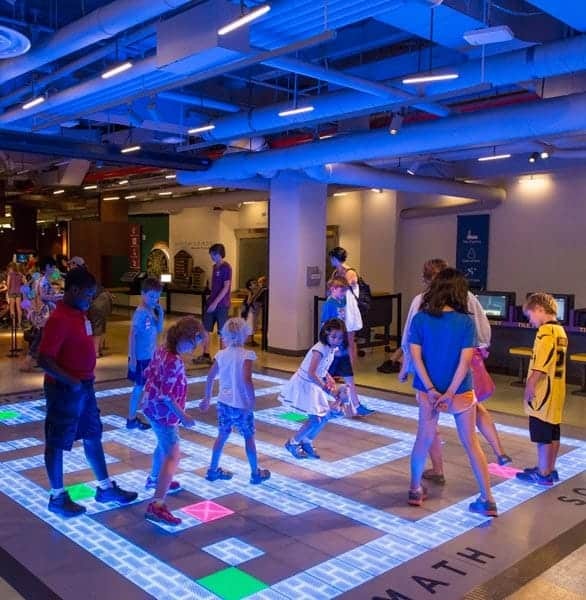 Whether you’re riding a square-wheeled tricycle, directing a robotic basketball shooter, or dancing on an interactive floor screen, you can make the most of your date night and see math in a new light at MoMath. I studied classical music in school, but I never really understood how powerful it could be until I heard a live orchestra play music that made my skin prickle and eyes tear up. I knew the basics of musical composition, but, once the symphony started playing, all those facts and figures flew from my mind, and all that remained was the music and how it made me feel. The symphony captured my imagination in a way that my music lessons never had. The live music transcended the notes on the page and became a thing of beauty and wonder. The people who attend symphonies may not understand every nuance of music theory, but they can appreciate the work and skill that go into a perfect crescendo or refrain. The National Museum of Math has inspired many couples to get out of their typical date patterns. Just as the symphony introduces people to classical music, the National Museum of Math in New York City introduces people to mathematics. Its exhibits aim to spark people’s imaginations and give them a reason to rethink what they know about math. MoMath has stylized itself as “the coolest thing that ever happened to math,” and it doubles down on that statement with engaging exhibits, galleries, and programs. MoMath has taken math out of the classroom with its many dynamic exhibits. The innovative museum turns mathematical principles into entertaining mind games and visually stunning displays. These experimental puzzles give people a lot to ponder, and it’s easy to see why MoMath has become a favorite date venue among local couples. Cindy Lawrence, the Executive Director and CEO of MoMath, said the museum attracts people who want to have a unique experience and look at math from another angle. Since opening its doors in 2012, MoMath has created a foolproof formula for fun and given daters a place where they can connect, learn, and grow. Today, nearly 1 million people have discovered the joys of math at MoMath, and more people come pouring in the pi-shaped doors every day. The museum is open from 10 a.m. until 5 p.m., seven days a week, 364 days a year (every day but Thanksgiving), so people can always schedule a math-centric date in New York City. The MoMath team aims to make math accessible to everyone from small children to retired couples. Its cool exhibits can pique people’s curiosity and give them something to discuss, enjoy, and geek out over. Even if you and your partner don’t share parallel interests in math, you can still have a good time exploring the museum’s array of wonders. Couples of all ages can get caught up in the fun of MoMath’s exhibits. Cindy told us that people who don’t like math undergo the greatest transformation at MoMath. These individuals often come to the museum because they think their partner or their children will like it, and they end up discovering they like it, too. After all, it doesn’t take a math degree to enjoy spinning around on a chair that can’t tip over. MoMath is a great focal point for daters in New York City because it offers a lot of unique conversation topics and date activities. You can ride around on square wheels or paint symmetrical patterns on a digital canvas. You can play around with parabolas and create three-dimensional sculptures in fun, hands-on exhibits. You can awaken your creative side at the National Museum of Math. People of all ages can engage with the out-of-the-box exhibits and gain a new perspective on how the world works. 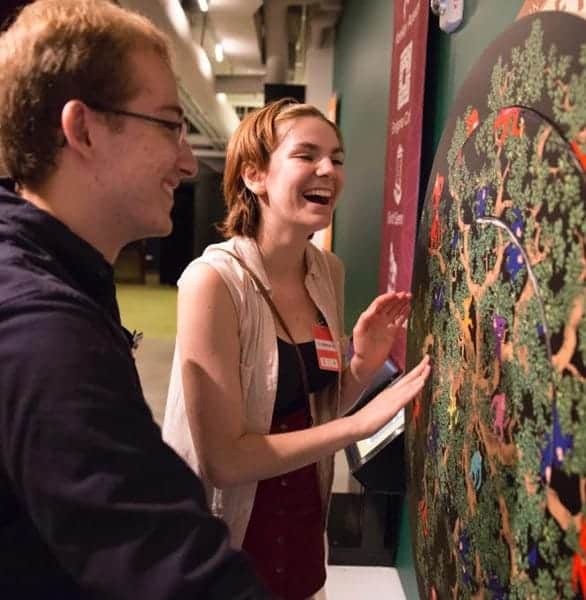 The MoMath calendar always has something designed to delight and amaze people, and its events can be affordable date activities for math lovers or those who just want to experience something uniquely engaging. MoMath keeps visitors entertained with its activities and events. Math Encounters is a free lecture series that’s available to anyone visiting the museum. These presentations take place on the first Wednesday of every month and touch on interesting topics, including the history of math, the nature of time, and the mysteries of the universe. A knowledgeable presenter can break down complicated math theories and how they apply in real-world situations. These lectures are far from boring — they can be about politics, fairy tales, doodling, chocolate, and numerous other everyday topics. In July 2018, Karl Schaffer turned heads by presenting his thoughts on how math intersects with dance. Another upcoming event of interest to dates is the Million Millimeter March for MoMath which will take place on the day when the millionth visitor enters the museum. When will that be? No one knows exactly, but you can register here for updates. Once the team calculates when the March will be, they’ll send out a mass alert with instructions and details. That millionth person is coming, and the celebration will be a one-of-a-kind, can’t-miss affair, so stay tuned. MoMath has become a popular destination for both out-of-towners and locals. The museum offers an undeniably memorable backdrop for life’s special moments. It has hosted many school field trips, birthday parties, date nights, and celebrations over the years, and some couples have even decided to pop the question here. Cindy said she has witnessed three proposals at MoMath. One person even got in touch ahead of time to plan something extra creative and romantic. The MoMath team happily made arrangements so that the couple’s song played on the speakers as they walked downstairs and the floor’s display screen lit up with a graphic of the Brooklyn Bridge and the words, “Will you marry me?” She said yes, and everyone at the museum burst into applause. MoMath has created a fun space where people can be enthusiastically curious, innovative, and nerdy, and many daters have capitalized on this opportunity to experience something new. People of all backgrounds enjoy playing around on the exhibits and learning something new along the way. The physical activities, tactile displays, and puzzling brainteasers all combine to delight and excite visitors. Sometimes you have to get out of the classroom to truly appreciate academic subjects. By exposing yourself to new ideas and experiences, you can discover passion and joy in some unexpected places. That happened to me at the symphony, and it can happen to couples at the National Museum of Math. Visiting MoMath can be a more engaging date activity than watching a movie or going to dinner because the museum gives couples so much to talk about and explore together. This wonderfully dynamic venue brings math to life and encourages people to experiment with numbers, shapes, colors, and other artistic displays.